Louis Wain – was an English Illustrator best known for his drawings, which consistently featured anthropomorphised large-eyed cats and kittens around turning of the 20th century. His cats are often humorous, but there’s a sad story why Louis began drawing cats. Louis Wain was born on 5 August 1860 Clerkenwell in London. He was the only male child of six to his parents. Born with a cleft lip and as a child, he was often truant from school, wandering around London. He studied at the West London School of Art and later he taught there. Then he joined the staff at The Illustrated Sporting and Dramatic News in 1882, began to draw cats in 1883. At the first, he specialized in drawing animals and country scenes and achieved the substantial success, which made his drawings immensely popular. Intelligence in the cat is underrated. Get your copy on Amazon! : Louis Wain – The Man Who Drew Cats by Rodney Dale (Author) Many charming illustrations and information of Wain’s life in depth and personal struggles. At the age of 23, Louis married Emily Richardson, who was ten years his senior, which was taken quite scandalous at the time. Quite sadly, Emily passed away after three years of their marriage. Prior to Emily’s death, he found the subject, which would define his career. One rainy night, they had rescued a stray black and white kitten after they heard him meowing. During Emily’s illness, this kitty comforted her in a great deal, her spirits were lifted by Peter immensely. And he began to draw extensive sketches of him. Emily couldn’t see them published while she was alive, which she strongly recommend him to publish. Get your copy on Amazon! : The Cats of Louis Wain by Patricia Allderidge (Author), Louis Wain (Illustrator) You can check his biography and the paintings before “schizophrenic cat paintings”. The illustration depicted 150 cats, many of them which resembled Peter, doing things such as sending invitations, holding a ball, playing games, and making speeches, spread over eleven panels. Louis illustrated about one hundred children’s books. And his cats appeared in papers, journals, and magazines. In 1898 and 1911 he was chairman of the National Cat Club. Get your copy on Amazon! : Louis Wain’s Cats by Chris Beetles (Author) This new biography will show many images for the first time ever, amongst 300 plates of richness and variety, all of which are originated faithfully from the original artwork. 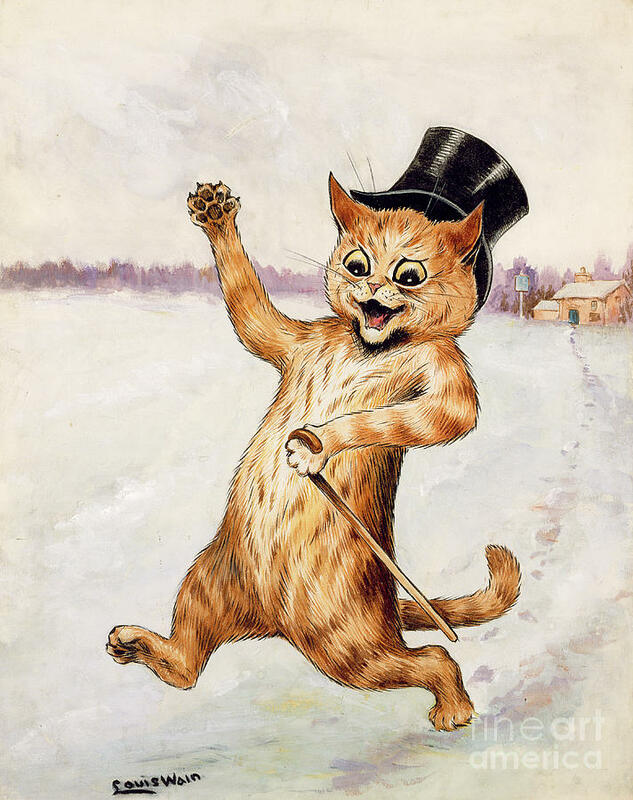 His cats often were illustrated as human, parody of human behaviors, satirizing fads and fashions of the day. He would take his sketch-book to a restaurant, or other public place and draw people in their different positions. He tried to express human behavioral characteristics on cats as much as possible. Despite his popularity, Louis always was financially in a poor state. It’s because he had to support his mother and sisters, and his naiveness made him pretty easy to be exploited in the business scene. Relatively pleasant with a garden and colony of cats, he spent his final 15 years at this hospital. He used bright colors, flowers, and intricate and abstract patterns, which some people claims as a sign of schizophrenia, while other argues as the patterns in his mother’s fabrics. Louis realized our imagination on cats into anthropomorphic images. From funny, mischievous to mysterious, a cat can play any roles on his paintings as a great actor. Drawing cats through years should have been his way of love for Emily and by keeping drawing them, Peter might have been alive in his soul. Get your copy on Amazon! : The English Cat Artist: A Fictionalized Biography of Louis Wain 1860-1939 plus over 65 kitten pictures. by Heather Latimer (Author), Geoffrey Hutchison-Cleeves (Editor), Louis Wain (Illustrator) The English Cat Artist contains 65 Louis Wain cat pictures containing around 800 cats (some in glorious color), with date and source of each one, plus 10 Wain personal pictures.